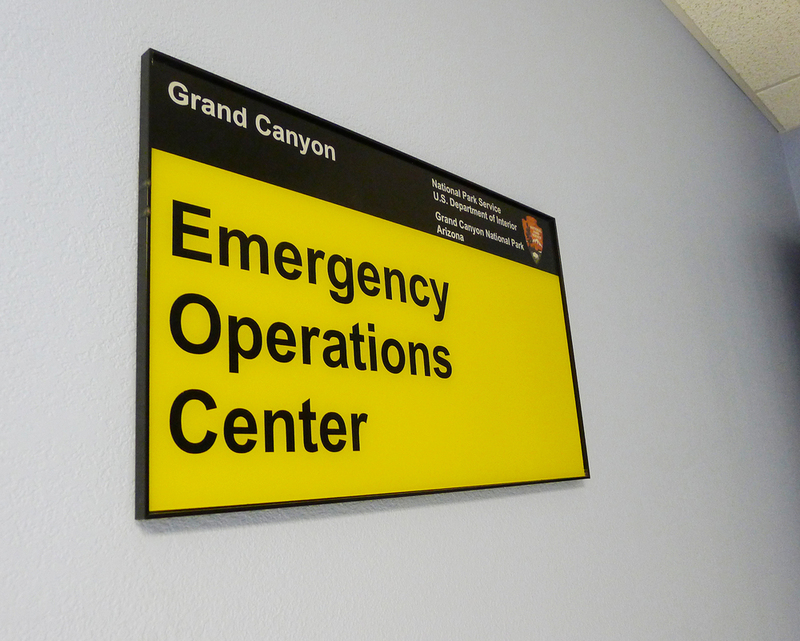 How might we reduce the need for hiker rescues at Grand Canyon National Park? I delved into a 'mini wicked problem' for my Masters thesis project: what causes Grand Canyon National Park to become a perfect storm of visitor calamity, and what interventions be able to help decrease the high rate of rescues? 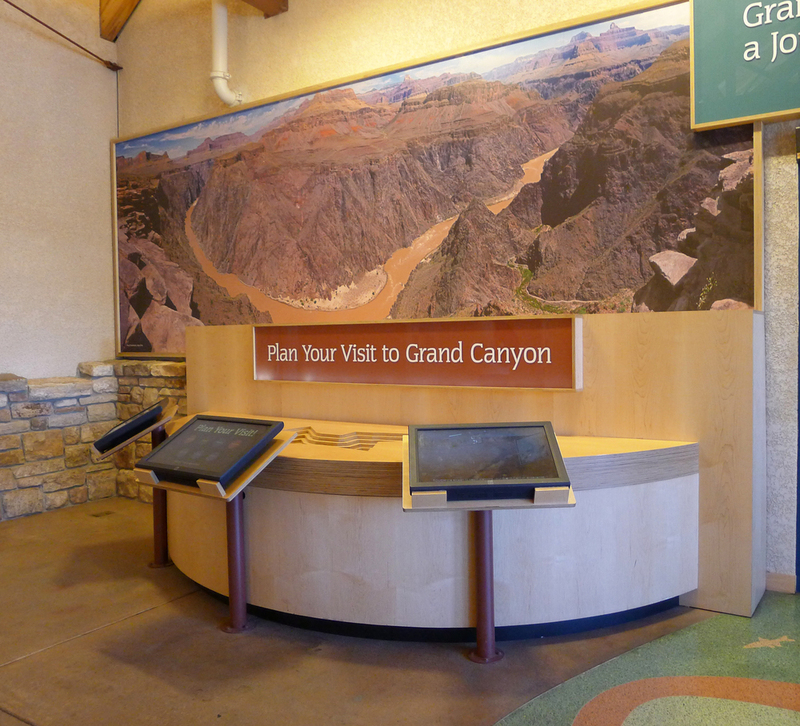 I used design research to explore what makes Grand Canyon so dangerous for visitors, and to audit current visitor safety efforts. Then I used a variety of synthesis methods, as well as looking to behavioral science and risk management, to understand further what I had found. 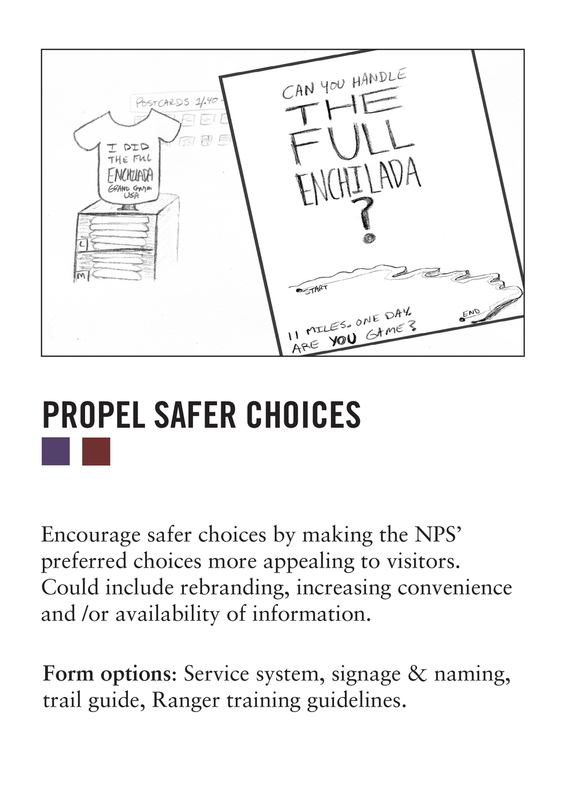 Then I explored how we might improve the situation by utilizing tools and best practices from information design, interaction design, service design and behavioral design to encourage better decision making, and nudge visitors towards safer choices. 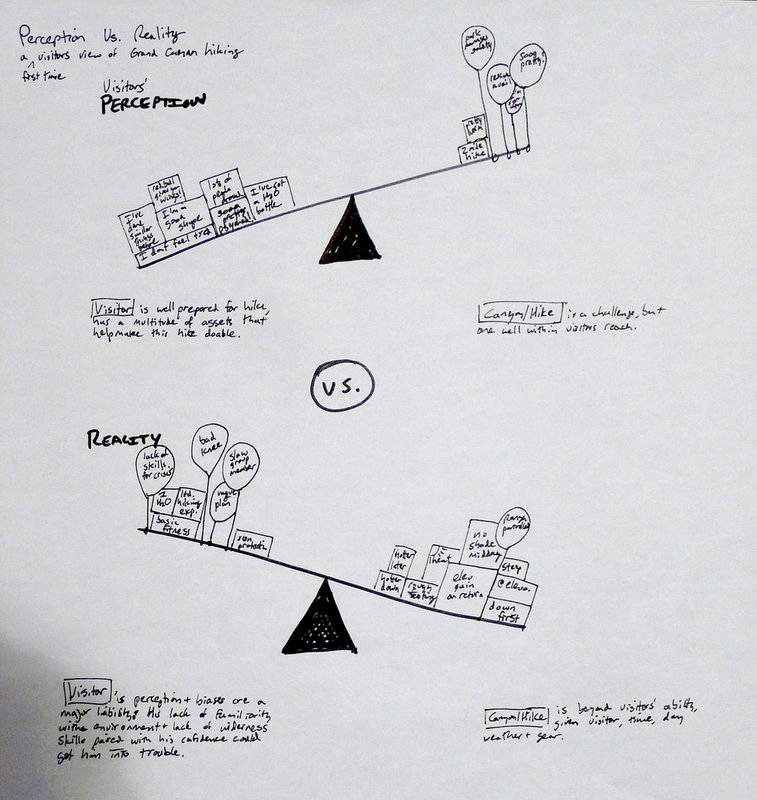 Download the final thesis document from CMU's Thesis Repository, or read on for the (somewhat) condensed process story. 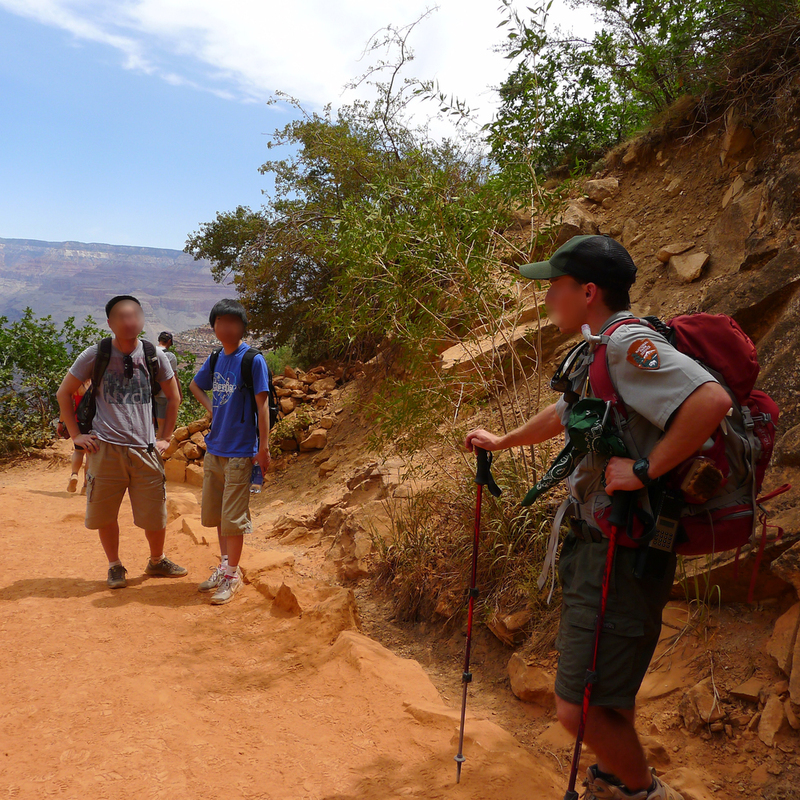 One interesting finding from my field research was around who hikes at the Grand Canyon. I decided to refer primarily to "visitors" in my thesis rather than "hikers" because most people hiking at the Grand Canyon aren't "hikers" at all - they're just normal people who hike when they come to a famous National Park because it's "the thing" to do there. Many are traveling in groups, and add a stop at the Canyon to a larger roadtrip or a vacation in Las Vegas. SYNTHESIS: WHAT IS REALLY HAPPENING & WHAT NEEDS TO CHANGE? My research trip was extremely helpful, but it also created a massive amount of data and insights for one person to synthesize. Since I had sought out not only to understand the problem’s “as-is” state, but to attempt to get to the bottom of it, there was alot to process. I clustered my ideas to see which problems I was innately draw towards solving, and why I thought that lever would work. This allowed me to work both forwards and backwards to reach a better understanding of the problems at hand, and how they interacted with one another. 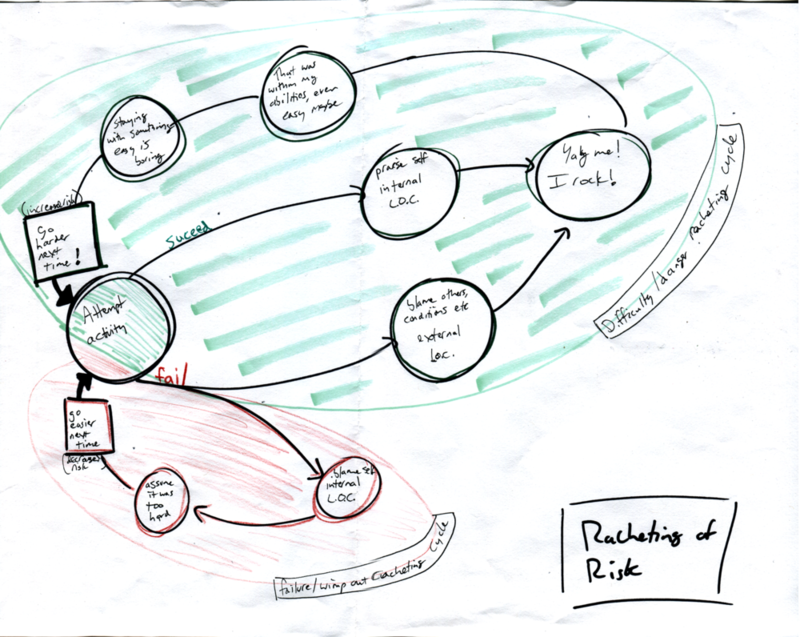 I also looped back to many of the theories and methods I had discovered in my exploratory research, drawing from risk communications, behavior science, and design. I was beginning to feel like I had a handle on what was going on, but it was still rather complex and interrelated, with a constellation of opportunities for improvement rather than a single unifying need. 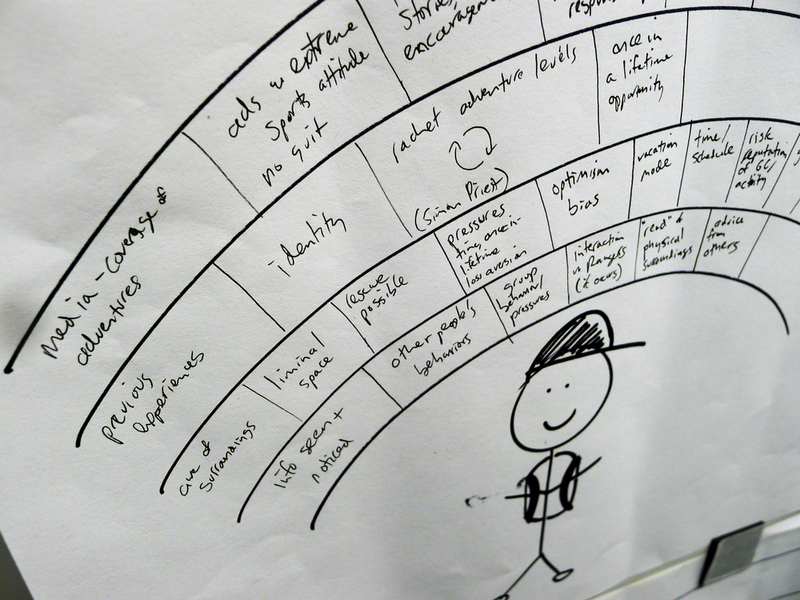 I found there were some key themes that bubbled up to the top level of the "why" tree of what led visitors to problems. 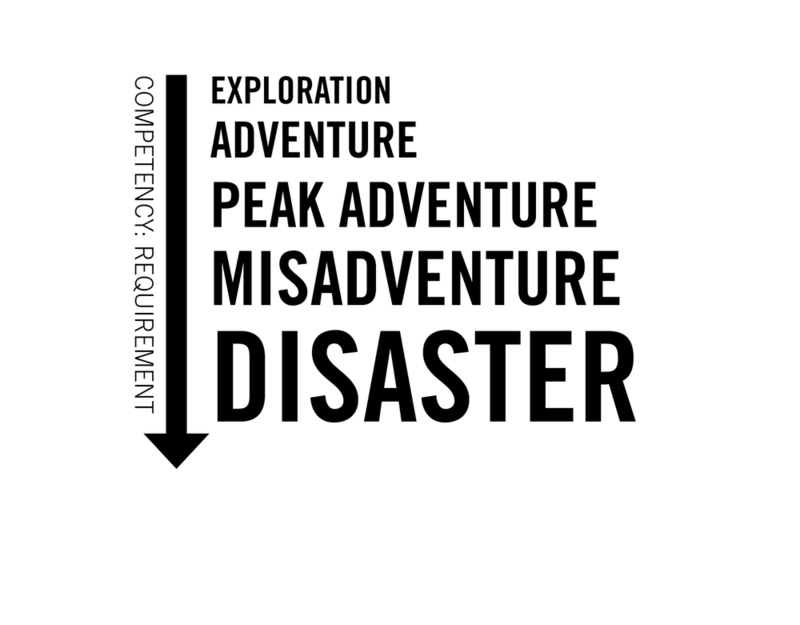 I found that visitors lacked the information they needed, they didn't have the right stuff for their hike, they were going farther than it was safe for them to go, and they weren't really understanding what they were getting themselves into. PREFERRED ORDER of understandings (pink) to inform actions (purple). 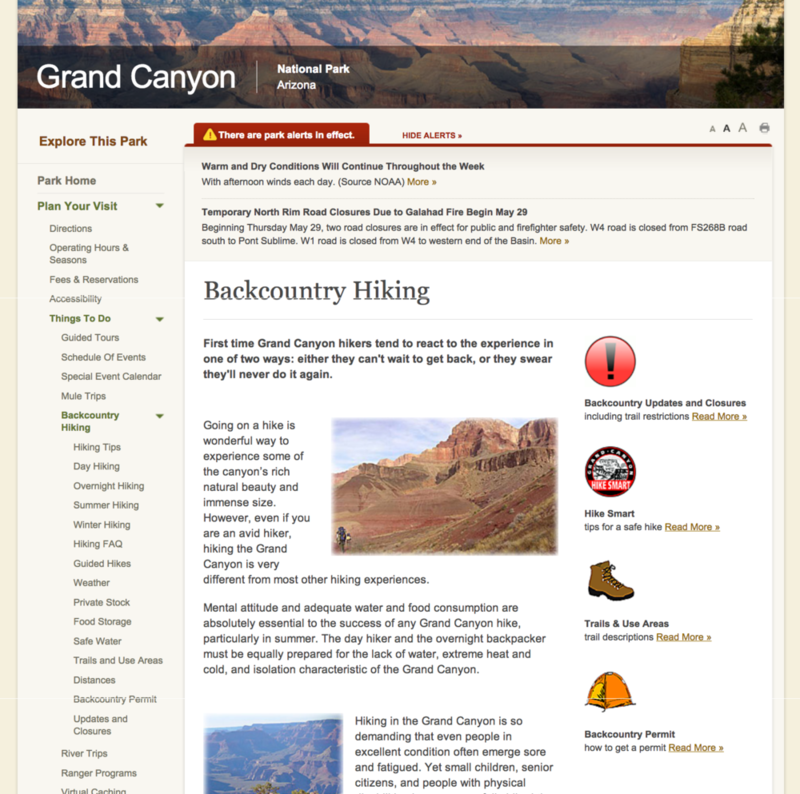 For instance, visitors should choose which trail to take based on understanding the challenges of the Canyon, and how difficult the hike being considered is, and what their group's fitness level is. Ideally each of the purple decisions are thoughtfully and actively made. OBSERVED ORDER of understandings (pink) coming after actions (purple). For instance, visitors often aren't even actively choosing a specific hike thoughtfully, and then they aren't realizing their group's ability level, or how hard their hike is until after they have, for reason, turned around and headed back uphill. This is obviously a bad time to realize you've choosen to hard of a hike because your only options at that point are to complete the hike back out of the canyon, or call for rescue. This meant that a key challenge was how to try to help visitors gain this understanding sooner - or be prepared to guide them more at the moments when they actually realize they need help. At the halfway point of the project we have a poster presentation to read out what we've done so far, and where we are headed. It was a challenge to boil down everything I had learned so far into a 15 minute talk and a single poster, but the forcing function helped crystalize my key learnings. 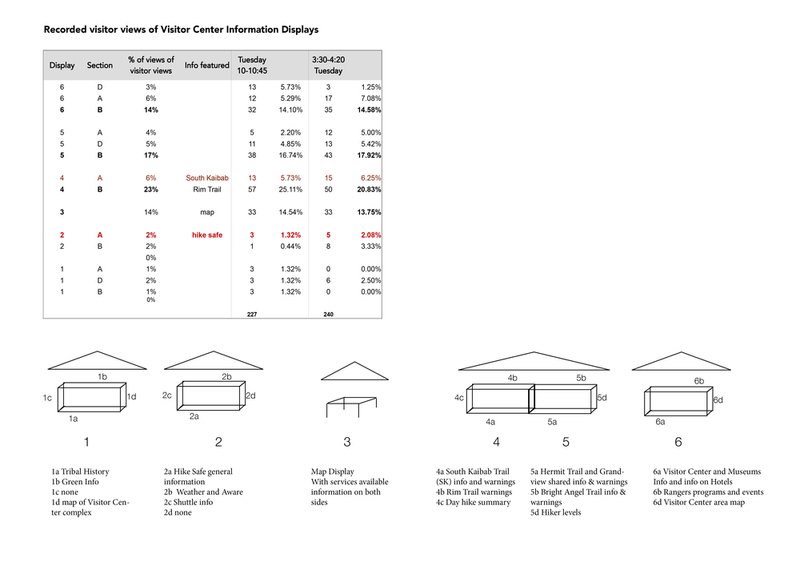 View the key diagrams below (click to enlarge) or view the full poster PDF in a new window. I found that contrary to popular opinion, YOLO visitors - those intentionally taking on risk, were actually a small subset of at-risk visitors. Most either didn't know they weren't acting in accordance with best practices, or thought that they were special and therefore not at risk. As I moved from the understanding the problem and its context to considering possible interventions, one possible direction I wanted to explore was a hike planner tool. This could help close the knowledge gap, and aide visitors in matching their skills and interests to an appropriate activity. It was also the most interactive and technological of my intervention options, so it could be a good fit to spend more time iterating on. I first asked participants to interact with existing information sources, and asked which hike they would choose based on this material. 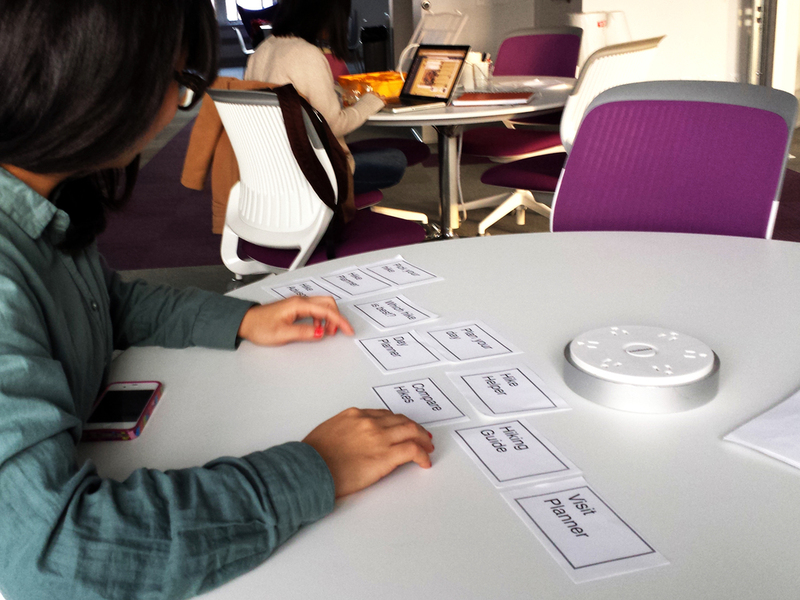 Then I speed-dated a few low-fi concepts that showed the kind of functionality an on-site activity choosing tool would have, and used a card sort to prompt a discussion and probe at people's expectations and needs were around hike planning. I was right that low-fi concepts were all I needed to learn if this approach could be fruitful - the feedback I received from testing these concepts was invaluable, and pushed me back away from a digital solution. Testers were offended by the idea of tech at the trailhead, without even being asked about it, and this was coming from CMU students! I also found that planners will have already planned before reaching the park, and that most of my problem hikers won’t want to engage with a planning tool in this way. While I was interested in using this project to explore the digital form a bit more, I was also excited to pivot back a larger world of possible intervention approaches and artifacts. My findings from this probe also aligned with my "order of operations" hypothesis that hikers didn't yet know they need help when they're about to start their hike. After sharing my new understanding of the as-is, analyzing the current intervention approaches, ideating some possible solutions, and testing one particular approach I had further solidified my approach to designing some possible interventions. 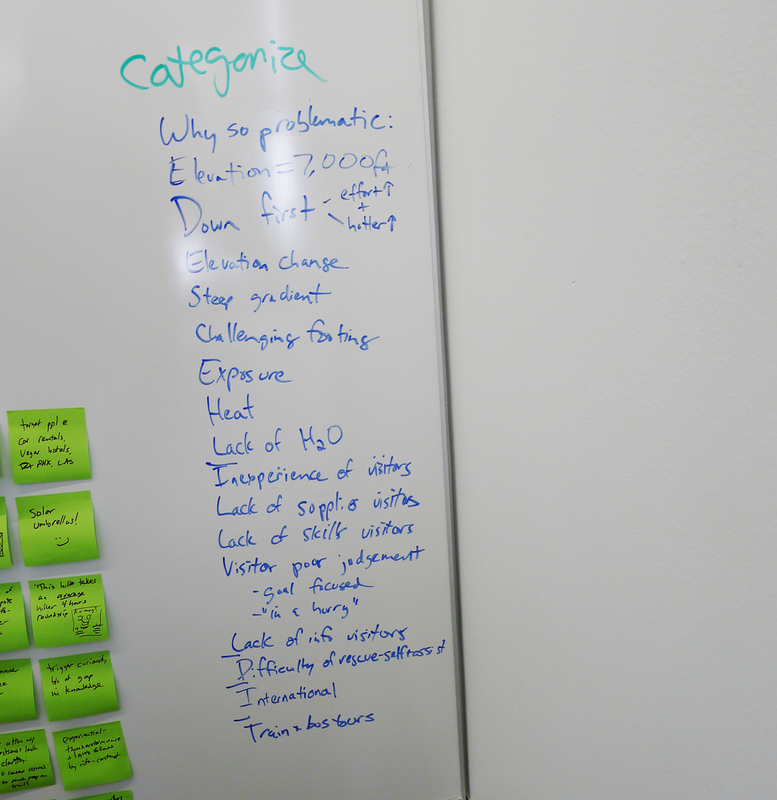 I still didn't know what the right answer was, but I had a good idea of what the goals of the interventions should be. How might we enable informed choices? As long as visitors are overconfident, they are likely to remain "deluded", dismissing warnings as intended for other people and making overzealous plans. I propose that by helping visitors be a little less optimistic, they can more accurately assess themselves and their hike, leading to smarter choices that decrease the visitor-hike mismatch. Countering optimism bias should also encourage them to realize more quickly when they are outmatched. How might we counter optimism bias? I found visitors often do not have a strong idea of which activities they want to engage in in advance. Instead, they look to find out what is “the” thing to do at the Park. Redirecting these defaults away from dangerous hikes could yield major safety gains. How might we boost alternatives? 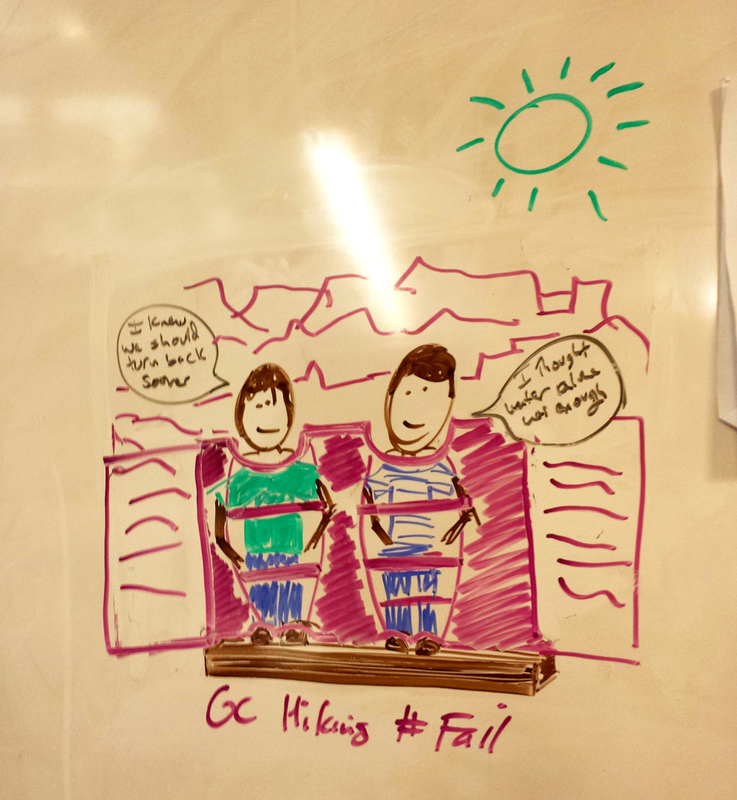 Having learned much more about the nature of the problem through testing just one possible solution, I wanted to explore more of my possible interventions and get feedback on each to really test my insights and principles. Unfortunately my time was limited so I didn't have a chance to iterate much, or get formal user feedback on my intervention ideas. Instead, these concepts serve as "conversation starters" that help illustrate what I learned and some ways we might begin to tackle this issue. 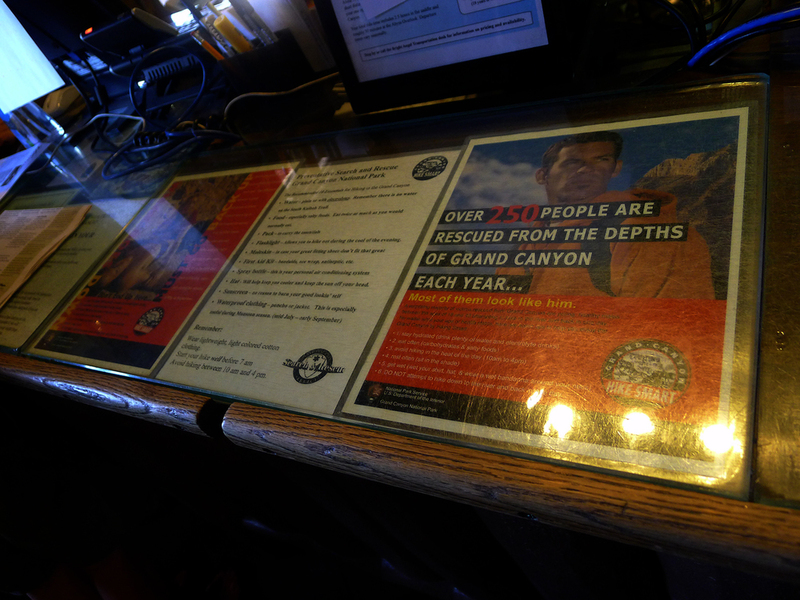 ON-TRAIL INFORMATIONAL SIGNAGE creates a designated decision point, precipitating group discussion. By framing the choice unambiguously as one of turn back now or continue on with a longer return hike, it challenges the tendency of visitors to mindlessly continue down the trail and encourages reluctant group members to speak up. DESIGNATED HIKING LEVELS makes it easier for visitors to gauge the overall difficulty of hike sections, and pairing this system with the LEVEL FINDER helps visitors choose the appropriate hike. AN ELEVATION-BASED MAP is designed to highlight elevation and effort and combat optimism bias by encouraging visitors to think about the way back uphill right from the start. 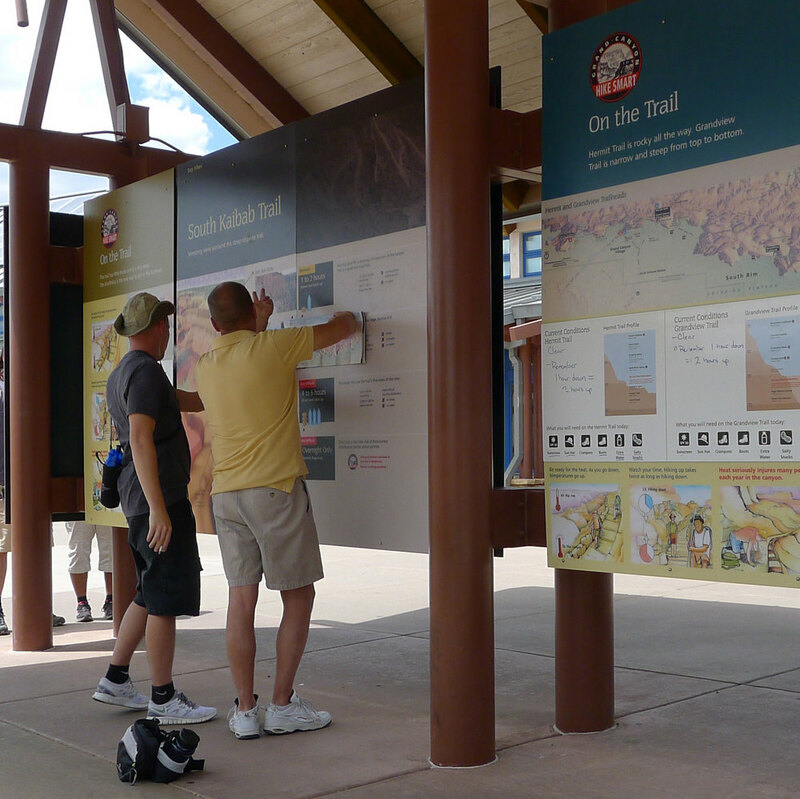 THE TRAIL GUIDE pairs the elevation guide with important safety and hazard information to empower visitors and remind them that things can and do go wrong. AN OVERVIEW MAP, styled similar to a ski resort trail map, highlights varying Hike Levels and allows visitors to visually compare trail length and steepness. A hawk’s eye view makes elevation change much more apparent and provides a sense of scale to help visitors begin to grasp the immensity of the canyon. 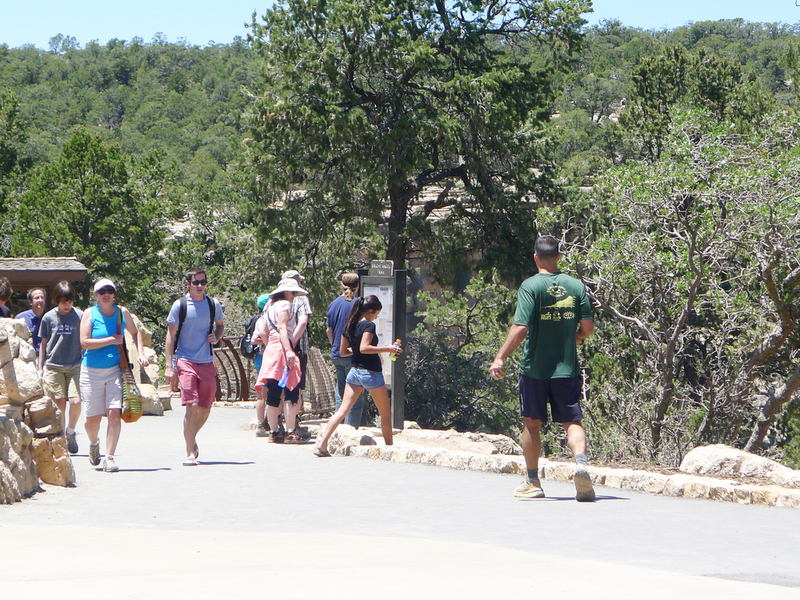 Helping visitors "get" the challenges of the canyon better before they begin a hike would help them make smarter choicer and be better prepared, but it's also a big challenge, because behavioral science tells us it's extremely hard to help people understand something experiential before they actually experienced it. 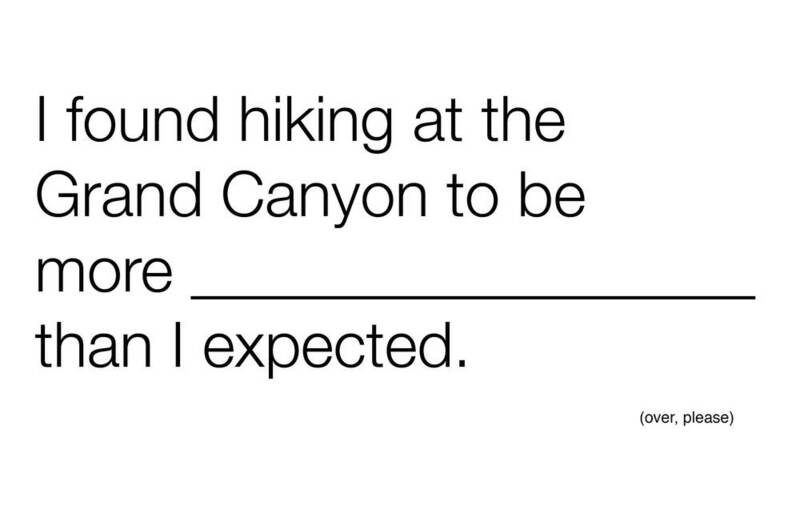 The UPHILL CHALLENGE creates a fun, interactive way to close the hot-cold empathy and perception gaps by letting visitors experience the challenges of uphill hiking at the Grand Canyon before they actually head out to hike. REBRANDING TRAILS makes safer trail options more appealing to visitors, and draws attention away from less safe options. 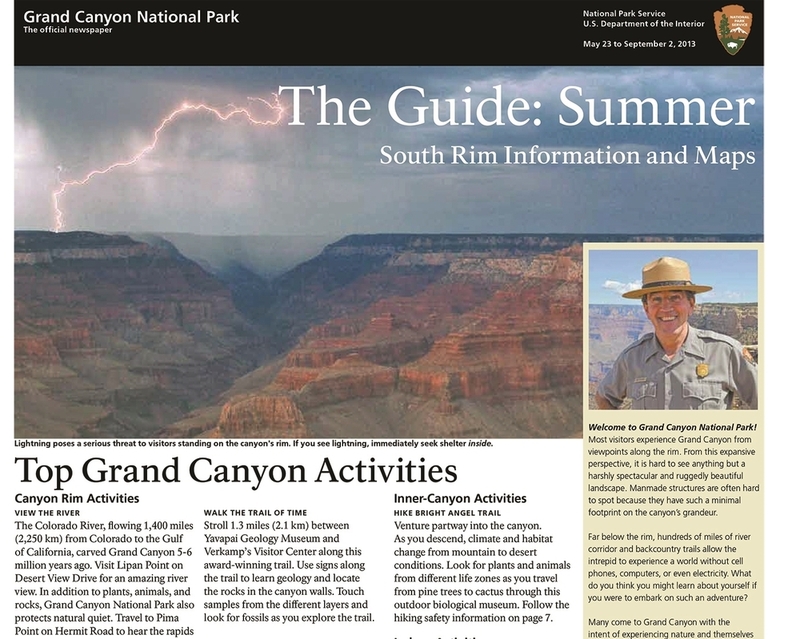 By rewording trail descriptions and choosing images associated with hikes and destinations carefully, the Park can help steer visitors towards better summer day hike choices. 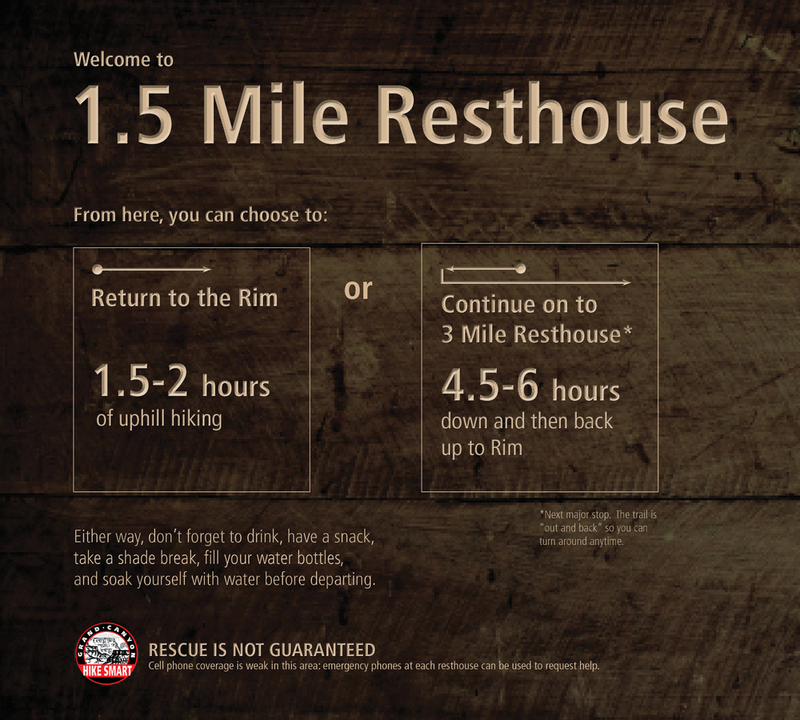 One example of this is rebranding the full length of the Rim Trail as a destination hike. The Rim Trail is 16 miles long, giving it great potential as a landmark hike for visitors, but current trail descriptions and branding make the Rim Trail unattractive to fit visitors. By creating a fun name - The Full Enchilada - and a brand, this hike can entice visitors away from long inner canyon treks that are much more dangerous. HOW DID YOU LAND ON THIS TOPIC, OF ALL THINGS?! I get asked this alot. Well, rather than starting from a particular area of design for my thesis, I wanted to start from a problem, and see how I could help tackle it through design. I was looking for a mini-wicked problem, if you will. I decided to focus on something that had bugged me for sometime. It’s something we hear about every summer: visitors to National Parks doing seemingly incredibly stupid things that get themselves killed or seriously injured. While experts quoted in the media dismiss the cause of these incidents as sheer stupidity, I suspected there was something more interesting going on, and I wanted to get to the bottom of it. My initial research confirmed that this was an issue of real concern for the NPS, and they were continuing to try new ways to address the problem. I thought by taking a fresh look at the issue through a design lens, I might be able to diagnose and treat the problem in new ways and help. Each year people make about a billion recreational visit to US National and State Parks: over 280 million recreational visits to the US National Parks. For the overwhelming majority of these visitors a trip to the park ends without injury or death. Yet, despite numerous preventative measures, people do continue to require rescue, and even die, while visiting parks. What is remarkable about these episodes is not so much their numbers; the vast majority of park visits occur without incident. It is that when incidents do occur, the surrounding circumstances can make the victims’ actions seem not only ill-advised, but downright foolish. One recent high-profile instance of this occurred in 2011 in Yosemite National Park. A group of visitors climbed over a guardrail alongside the Merced River just 25 feet above the edge of 317-foot Vernal Falls. They stood in the cold, rushing water to play around and take photos. Bystanders urged them to return to safety. Suddenly, one person lost their footing, and fell into the raging river. A second person tried to rescue the first victim, and fell in too. Then a third person went into the water as they tried to help the second. All three perished after washing over the falls. And park staff tends to agree that “human error” is a major contributing factor to injuries and deaths in the parks. 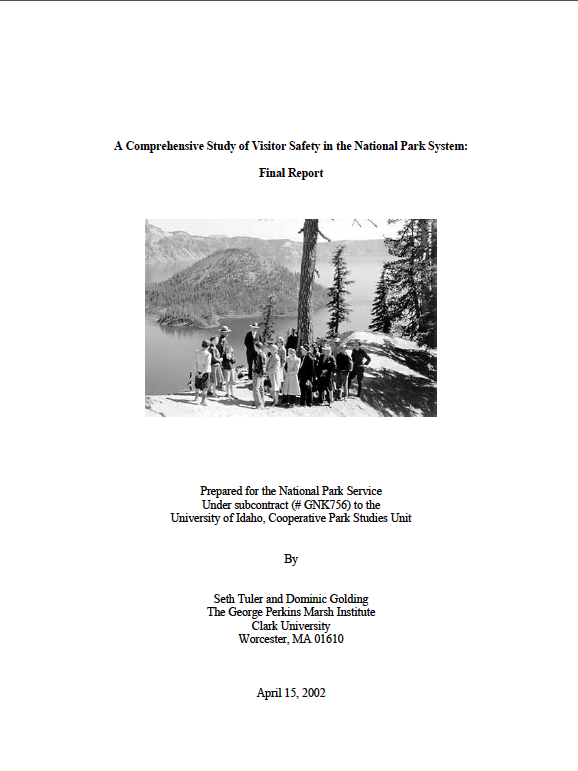 In fact, it was cited by 100% of park staff surveyed from 30 National Parks as being a medium or high factor contributing to visitor accidents, making it the highest rated factor in the survey. Human Error was followed by behavioral factors (such as playing, running), age, level of visitor preparedness, and level of visitor experience in activity. But is this type of behavior really beyond belief? Should we still be surprised, with all we know about human beings that people sometimes do things that don’t seem to make a lot of sense at first glance? In other words, is attempting to reduce human error not a key responsibility of safety communications, rather than something that falls outside of it? This difference could be a result of self-reporting bias, but it could be something much more troubling. Do visitors think that they are heeding warnings, being prepared for activities, when in fact they are mistaken? And are park staff members dismissing this mismatch as human error, rather than recognizing a critical communications failure. Whether it is due to miscommunications, or “human-error,” if parks know that visitors will err, should they not design with that in mind? No one actually asks this, but that process is a pain, so I'd like to give myself credit for this. Our thesis projects were required to go through the IRB approval process, and while I did pass as a IRB-exempt study, that still added additional constraints especially on recruiting for and conducting user research. Becoming an official study at a National Park also involves a large waiting period and alot of red-tape, so I worked at the park with permission from the SAR Ranger team, but without official approval as a research study. This meant my interaction with visitors needed to be limited to observation and informal contact that didn't draw too much attention. I was expressly prohibited from probing visitors more formally due to a lack of official study approval from NPS.